As great as it was to escape to paradise, it was nice to come home on the weekend. Sure we came back to a little cold and snow but there’s no place like home. Since we hardly slept on the way home, we were exhausted and all of us had a nice long nap. We were starving when we woke up but had no desire to cook. Amato Gelato to the rescue! Amato Gelato in Chestermere has opened a side business in their gelato shop, Al’s Grill. 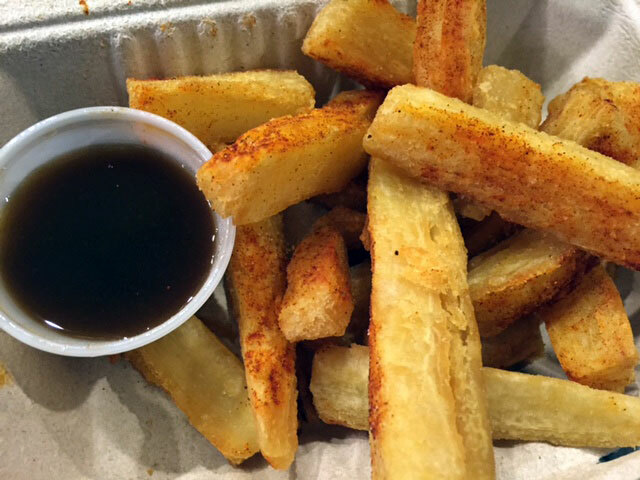 Al’s Grill features East African specialties like fried cassava, pili pili fries and chicken poussin. We ordered the mishkaki chicken combo which came with 3 skewers of marinated chicken, salad, fries and naan. It was delicious! 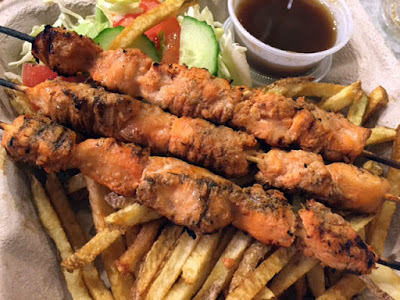 The chicken was flavourful and moist and I loved the skinny fries that it came with. The best part was that Z, who had refused to eat anything for a few meals, loved the chicken and devoured a couple of sticks of chicken. Made this mamma very happy! We also had the fried cassava which was cooked to perfection. It was crispy on the outside, soft on the inside and perfect with the tamarind chutney that it came with. We can’t wait to go back and enjoy some more of their delicious food. Next time, we will have to leave room for dessert! We are definitely lucky to have this gem in Chestermere. With great service and friendly owners, it’s definitely a business that deserves support.